Patented 'Boron-Carbide' shackle. 50% harder than hardened steel. Covered keyway for superior weather protection. Reinforced body bumper to protect against scratching. 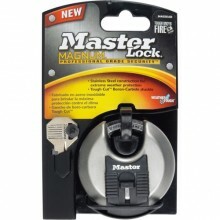 Click the button below to add the Master Lock® 70mm Magnum Disc Lock to your wish list.